June part 2 | What Car? The Jag wasnt too much of a drinker, either. My hundred-mile daily round commute means I tend to spend quite a bit of my life at fuel stations and feel a good deal of pain when perusing the debit column of the Tullin bank statement. That was why I loved the Jags 83-litre fuel tank and 35mpg average. Fuel stops were still painful, but at least they were a long way apart. Problems? Well, Ive never been a fan of touch-screens and the one in the XJ did nothing to change my mind. Simple tasks such as switching between the radio and the climate controls could be real hit-and-miss affairs. More irritatingly, there was an issue with the fuel filler flap, which stuck in its unleaded prevention mode, making it painfully slow to fill the tank. Worst of all, the drivers seatback developed excessive play at 20,000 miles. Guy Salmon of Thames Ditton quickly sorted both these issues, although the initial fix on the seat quickly failed, so I had to rebook the car to have the seat replaced. 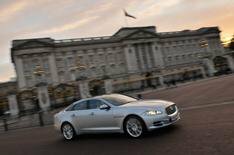 Its easy to see why Jaguar dealers do so well in our JD Power survey. For a start, the staff at Guy Salmon were always courteous and happy to provide expert opinion. Also, no matter how late or how grubby the car was when I dropped it off, it was always ready when promised and valeted. Otherwise, the only things that stopped the Jags wheels from turning were some routine software upgrades when the car went in for its 16,000-mile, 350 service. So now I have to decide whether I would be in the market for a used XJ when the time finally comes for Mr Cameron to sell off his fleet. Theres a simple answer to that: yes, Prime Minister.